(c) any person, Government agency, local authority or statutory body for the purposes of religious, welfare, bereavement, health or public transport services. (ii) other than matters relating to matters specified in (i) outside Malaysia. The Regulations seems broadly worded, with little specifics regarding the definition of management services and the type of management services that are subject to service tax. Management services covers the organisation and coordination of activities of a business in order to provide services to the clients and these services are not categorised under any specific taxable services (i.e. prescribed services). These activities consist of organising, supervising, monitoring, planning, controlling and directing business’s resources in terms of human, financial, technology, physical and other resources. The written contractual agreement between the person and client will be used to determine whether the services provided can be classified as management services. In a situation where no contractual agreement exists, the services may be treated as management services if such services meet the abovementioned definition. vi. Warehousing management services including comprehensive supplies recoupment activities, warehousing, maintenance, order, packaging, delivery and etc. ix. Provision of outsourced management services by third parties. xi. Provision of sports facilities management services. It is worth noting that RMCD guides are not rulings and are neither binding on the RMCD or on any party that follows the recommendations provided in the guides. The specification of management services in the Guide on Management Services (and not the legislation) serves as mere guidance. It allowed the RMCD to work under a broadly defined legislation, which could lead to unfair interpretations against the taxpayers. It is also worth noting that the Guide on Management Services has been withdrawn for some time. xii. matters outside Malaysia other than matters stated in (xi). The amended Regulations also include a general category for management services made on behalf of another person. The inclusion of a specific list of taxable management services should provide more certainty to taxpayers. Those who fall in the abovementioned list should review their contracts to determine if they are indeed providing management services. 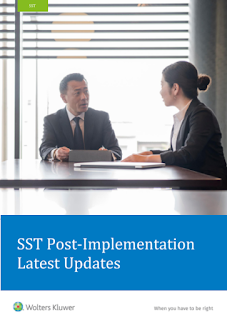 Wolters Kluwer’s SST Post-Implementation Latest Updates, Recent Changes and Amendments workshop aims to provide guidance on various changes made the legislation, guides and rulings as well as the latest SST updates arising from the Budget 2019 so as to mitigate the risk of non-compliance.